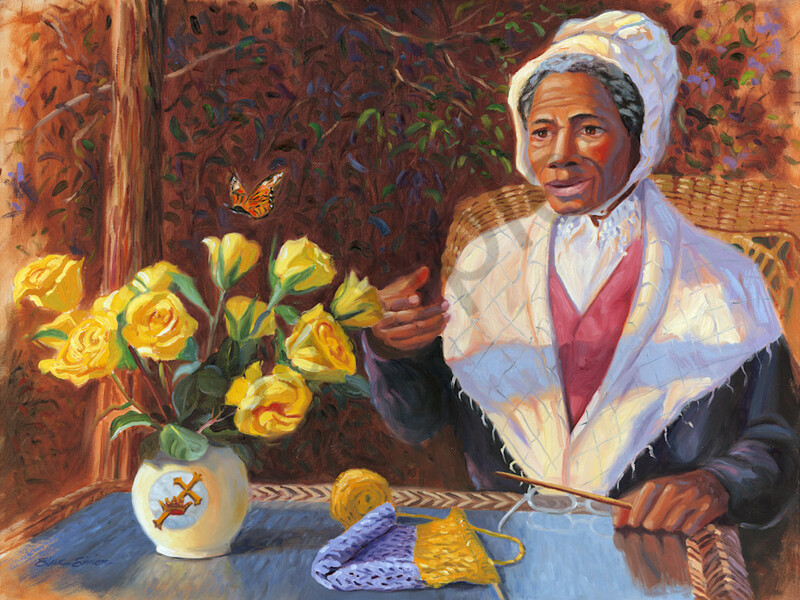 Oil painting portrait of the famous escaped slave and abolitionist Sojourner Truth taking a break from her favorite hobby to appreciate a chance encounter with a Monarch Butterfly. Sojourner Truth was a famous escaped slave, originally named Isabella Baumfree, who one day claimed "The Spirit Calls Me and I Must Go." She took the name Sojourner Truth and traveled, preaching an abolition to slavery, women's rights, religious tolerance, and pacifism. She is shown here with a vase of yellow flowers, symbolizing freedom, and a butterfly, symbolizing transformation.